PDF Shabby Thanks pattern...pattern designed by Mickey Zimmer for Sweetwater Cotton Shoppe. If you have been trying to find that shabby-fied autumn decor...you've found it! Shabby Thanks is just that. We've brought together some of our favorite things--wool, vintage buttons and lace, EdMar thread, and soft autumn colors like grey, apricot, and tan. 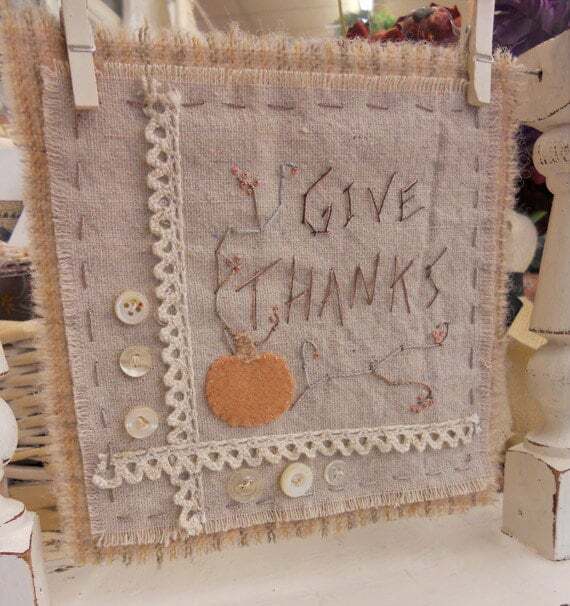 Easy stitches and wonderful embellishments makes this autumn lovely a keeper. Stitches used are: whip, couching, French knots, and straight stitch. This listing is for the PDF pattern only, so you can use grandma's buttons and lace, vintage wool, and any other bits and bobs you have stashed away for a rainy (wintery) day. If you have any questions...please convo me. If you'd like a certain color wool, please convo me and i can send a picture of wool we have available.